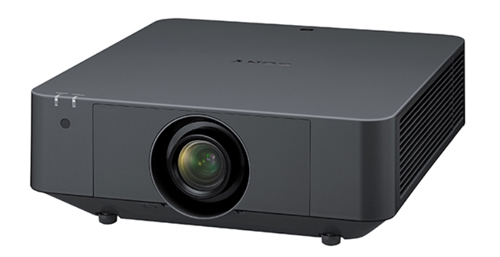 Sony has announced the VPL-FHZ75 and VPL-FHZ70 laser projectors at ISE 2019 in Amsterdam, designed to fit the high brightness needs of schools, houses of worship, museums, corporations, and midsize corporate and entertainment environments. Rated at 6,500 lumens and 5,500 lumens, respectively, the VPL-FH75 and VPL-FHZ70 are both WUXGA models offering 1920x1200 resolution, utilizing a 3LCD design based on a newly developed 0.76-inch LCD imager with an integrated "optical compensator" said to improve contrast. Image detail is further bolstered by Sony's Reality Creation resolution enhancement technology developed for the company's home projectors and displays. These projectors were designed with easy installation and maintenance in mind. Critically, they offer interchangeable lenses with a 1.6x zoom included as standard, and they boast a massive -5%/+70% vertical lens shift—said to be the largest swing in the industry for projectors in this brightness range—as well as +/-32% horizontal shift. The 20,000 hour laser light source eliminates lamp replacements, and an automated filter cleaning system eliminates dust after every 100 hours of operation. There's even an automatic color calibration system that uses an integrated color sensor to return the projector to factory image quality after extended use. Both models have the same modern and relatively compact design (approximately 18 x 7 x 20 inches, WHD) and are available in white or black. Sony is also introducing an "Intelligent Setting" feature that leverages the company's experience in laser projection along with extensive customer feedback to select the best tuning for the projector based on the environment. Users can dial in one of four pre-set options including meeting/classrooms, museums, entertainment venues, and multi-screen setups. The projector optimizes its light output (as with the bright image required for classrooms), fan noise (which needs to be low in a museum), or color (where color-matching is critical in multi-screen installs). Pricing for the VPL-FH75 and VPL-FHZ70 have not yet been announced.